Streetscape in Hinton's historic downtown. 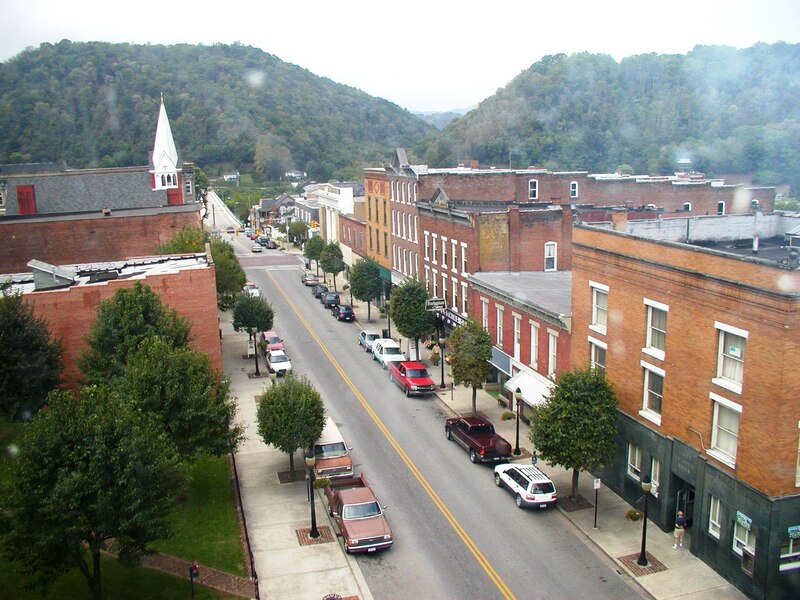 At the confluence of the New, Greenbrier, and Bluestone rivers, Hinton, West Virginia, (population 3,000) is a characteristic Appalachian mountain community established in the 19th century. John “Jack” Hinton formed the town by parceling lots from his wife’s land in 1831. Situated along a travel route between Lewisburg and Beckley, Hinton grew slowly over the next 40 years. Union and Confederate forces skirmished near the town in 1862. Following the war, the Chesapeake & Ohio River Railroad cut through the New River Gorge in 1871 and based its operations in Hinton. The legendary “steel drivin’ man” John Henry worked the rail line in nearby Talcott. During its first 10 years of operation, the C&O Railroad donated three acres in Hinton for a courthouse for the newly formed Summers County. Over the next 30 years, Hinton acquired a hospital, banks, and industries, and later combined with the communities of Avis and Bellepoint to incorporate in 1927. Hinton’s economy continued to grow into the 1950s but began to decline when locomotives moved from steam to diesel power, requiring fewer crews. Passenger rail service and the demand for coal waned by the 1980s, leaving the city to pursue tourism and technology as its economic base. Downtown Hinton is a National Historic District and includes 200 buildings, most of which represent American architecture between the 1880s and 1920s. The Summers County Courthouse, completed in 1898, is the district’s centerpiece. Other noteworthy structures include the Hotel McCreery, built in 1907, and the C&O Railway passenger station, home to the West Virginia State Historic Preservation Office. The Campbell-Flannagan-Murrell House, built in 1875, is undergoing restoration while remaining open to tour groups. Each year the community celebrates the Festival of the Rivers, featuring traditional music, craft vendors, and canoeing on the New River. Another annual event, Railroad Days, is sponsored by the Hinton Railroad Museum.